The U.S. Department of Education awards the National Blue Ribbon School of Excellence each year. Tennessee Christian Preparatory School was selected based on the test scores achieved by the students in reading and math, which placed us among the Exemplary High Performing Schools in the nation and state. High Performing means that the achievement of the TCPS students placed the school in the top 15 percent in the nation in Reading and Math as measured by the nationally normed test, the Stanford Achievement Test. Public and Private schools compete for the National honor each year. In 2015, TCPS was the only private school in Tennessee to be awarded this prestigious honor. Each state’s commissioner of education nominates public schools for the award, and CAPE nominates private schools. All winning schools are honored in Washington D.C. in the Fall. 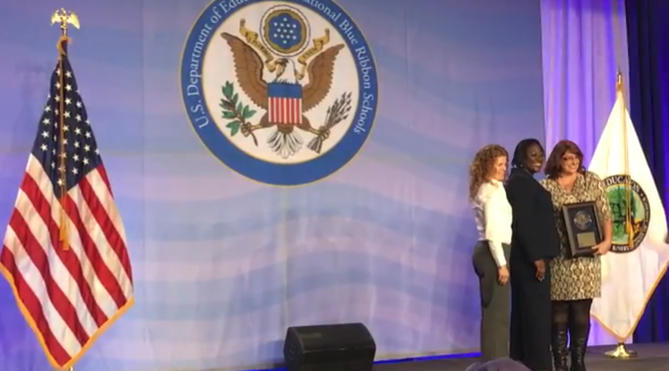 Principal Kathi Douglas and First Grade Teacher Lacy Laman at the presentation of the Blue Ribbon award in Washington DC. This honor recognizes the students’ accomplishments and the hard work and dedication that went into their success. The journey to Blue Ribbon was accomplished through collaboration, intentional instruction, and strong relationships in school and with the community. This award represents excellence-in vision, in implementation, and in results.